Who are we, what do we do and why will it make you happy to visit us? Watch this and come over. A one-month low-cost package holiday on a Greek island, combining yoga, meditation and awareness in a playful atmosphere. Check out our selected workshops for 2019 and choose your option. From Yoga to Movement, from voice work to Kundalini. Delicious Thai/Asian menu with Sushi, live music, and amazing views over Naxos. Orly Doctori (Ujallah) is here from May to October, with workshops, weekly Rings, private sessions and special events. 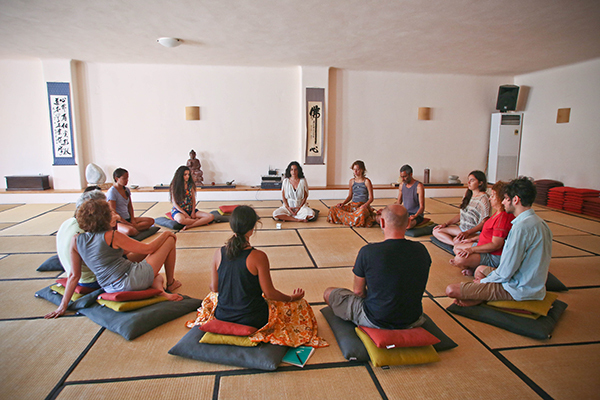 Check our weekly activities here, from Yoga, to Meditation, Kundalini or The Ring.